Lots of people have a love/hate relationship with the ACA (Obamacare). The good parts are quite nice. But the bad parts hit people where it hurts the most - in their wallets. Watch This Video. 31 minutes. If it doesn't work for you, or if you cannot afford your insurance, you have no choice but to opt-out. Does that make you a fugitive? Nope. The law gives you the choice to opt-out and pay the penalty if it applies to you. If you do so, and go "un-insured", you can look at Obamacare in an entirely new way. It becomes "pre-existing condition" insurance. Not bad. The days of cheap insurance are gone forever. For a family that does not qualify for a subsidy, the combined annual cost of your premium+deductible is around $25,000 per year. It doesn't matter which plan you choose. With that much money on the table, could you do better on your own? With that much financial risk each year, do you feel "insured?" So, for many middle income Americans, the best advantage of Obamacare is discovered when you opt-out, and pay the penalty. It puts you in control of your finances, and mitigates many of the risks associated with being uninsured. Can the uninsured come out ahead financially? What does history say on this question? What about penalties, exemptions, and opt-in conditions? 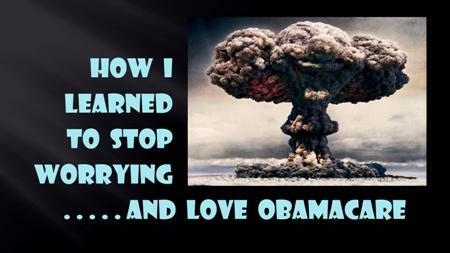 If you do it right, you can learn to stop worrying and love Obamacare.